Other Products by Herbs Of Gold. Search other Childrens Health products. Herbs of Gold Childrens Mulit Care provides a multivitamin and mineral formula specifically for children. Many children are fussy eaters and with many food allergies now known some children are missing out on key nutrients. Childrens Mulit Care provides a broard spectrum nutritional supplementation to support nutrient deficiencies and help maintain general wellbeing. Herbs of Gold Childrens Multi Care delivers 21 vitamins and minerals including: the B vitamins thiamin (vitamin B1), riboflavin (vitamin B2), nicotinamide and pantothenic acid (vitamin B5) to assist in cellular energy production; Vitamins A, C, D and zinc are important for supporting healthy immune function and maintaining healthy skin; along with iodine to help maintain healthy brain and cognitive function. Research is indicating that even though Australian's typically eat enough calories, their micronutrient levels are still far from adequate. Research indicates that some of these key nutrient deficits are zinc, magnesium, iodine and selenium1,2,3,4. 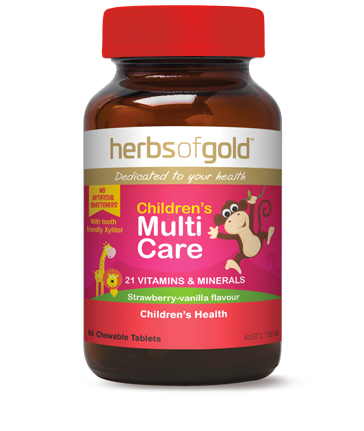 Herbs of Gold Childrens Multi Care is a fantastic nutritionally supportive product that may be taken once or twice daily, depending on the child's age, to assist in meeting their micronutrient needs. However, it is important to note that even high quality supplements can not make up for a poor quality diet, that is lacking in high quality protein foods, fresh vegetables, fruits, nuts, seeds and legumes, and dairy products. Children 2 - 8 years - Chew 1 tablet daily. Children 9 - 13 years - Chew 2 tablets daily. Or take Childrens Multi Care as directed by your healthcare professional. Does not contain added egg, milk, peanut, soy or tree nut products, yeast, gluten, lactose, artificial colourings, flavourings, sweeteners or preservatives. 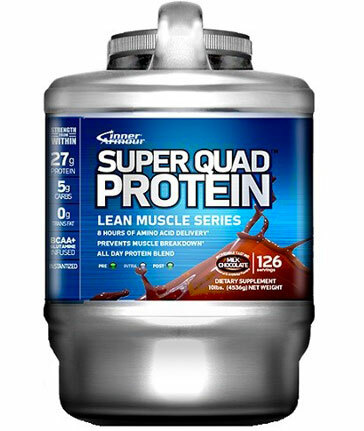 How Much Protein Is Required For My Activity Level? How Does Protein Benefit Muscle Growth?